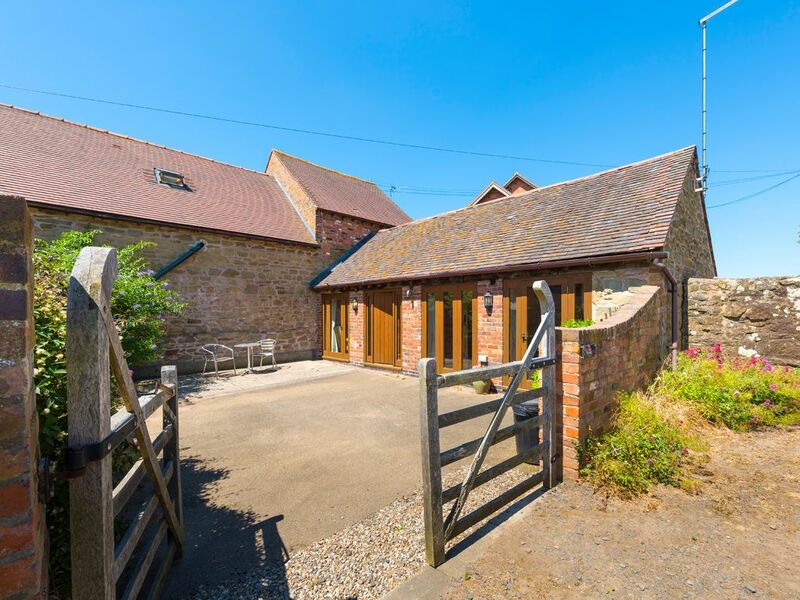 This 18th Century detached barn conversion features a wealth of original features, including oak beams, trusses and wall timbers. With an open-plan living area and French windows onto the courtyard, the property has a light and airy feel, offering all necessary modern facilities but is cosy enough for a quiet break for two. Set in a pretty countryside location, this property is perfect for walkers, cyclists and birdwatchers, and is close to all local amenities and activities. Amenities: Electric central heating. Electric oven & ceramic hob, microwave, fridge, washing machine (in utility cupboard), dishwasher, 2 x TVs with Freeview, DVD, CD/radio, WiFi. All fuel & power inc. in rent. Bed linen & towels inc. in rent. Off road parking for 1 car. Lockable bike storage. Front, stone walled courtyard with garden furniture & BBQ. Free coarse fishing available 5 mins walk from property, fishing also available on nearby river and pools at additional cost. Sorry, no pets & no smoking. Shop and pub 1.2 miles (via ford, longer on the way back) or 4 miles. Note: This property is only suitable for a maximum of 2 adults and does not accept children.Charging of electric cars can be arranged with the owner if required, please advise if this when arranging the key collection. Town: The small village of Billingsley is surrounded by beautiful Shropshire countryside and is just seven miles from Bridgnorth. In addition to lots of walking and cycling facilities, the region boasts a wealth of country parks, great houses, museums and picturesque villages. Visitors can enjoy a trip to the nearby town of Bridgnorth - winner of âBritain in Bloom' - which is composed of the High Town and the Low Town connected by winding streets and flights of steps. The town's Saturday street market provides an excellent chance to explore the impressive castle ruins or to take a ride on the funicular railway. This passes what Charles I called 'the finest view in all my kingdom'. With easy access to The Royal Air Force Museum, Ironbridge Gorge, and the towns of Shrewsbury and Ludlow, this is an ideal base for an enjoyable break. All ground floor. One double bedroom with TV and en-suite (shower, basin & WC), exposed beams & French doors to courtyard. Open plan living area with fitted kitchen, dining area, sitting area with sofa bed, exposed beams & French doors to front courtyard. Electric central heating. Electric oven & ceramic hob, microwave, fridge, washing machine (in utility cupboard), dishwasher, 2 x TVs with Freeview, DVD, CD/radio, WiFi. All fuel & power inc. in rent. Bed linen & towels inc. in rent. Off road parking for 1 car. Lockable bike storage. Front, stone walled courtyard with garden furniture & BBQ. Free coarse fishing available 5 mins walk from property, fishing also available on nearby river and pools at additional cost. Sorry, no pets & no smoking. Shop and pub 1.2 miles (via ford, longer on the way back) or 4 miles. Note: This property is only suitable for a maximum of 2 adults and does not accept children.Charging of electric cars can be arranged with the owner if required, please advise if this when arranging the key collection.